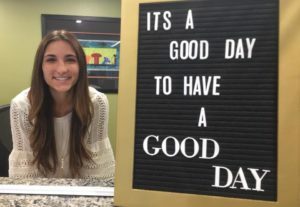 On April 16, 2018, Manatee Community Foundation’s new donor and event coordinator Madison Larkin started in her role. Madison coordinates our donor, nonprofit, board and community events; coordinates the use of our building by internal/external clients; and works in partnership with our team members on donor relations, nonprofit communications, and media relations. Madison was born and raised in northwest Bradenton. She graduated from Florida Gulf Coast University, where she earned a B.A. in Communications with a concentration in Public Relations. She was on the Dean’s List and the President’s List and served as a peer academic leader supporting and encouraging freshman students at the start of their post-secondary journey. For the last year, Madison has been a project coordinator for Angelli Pools and Construction and is looking forward to working in the philanthropic sector. We are so excited to welcome Madison. Stop by and visit her or email Madison at MLarkin@ManateeCF.org.